It was only back in June 2012 that I wrote an article detailing Liverpool's best five Lebanese pizzerias. There were only five at the time but how quickly things can change. There are now 12 pizzerias and these are only the ones I'm aware of. 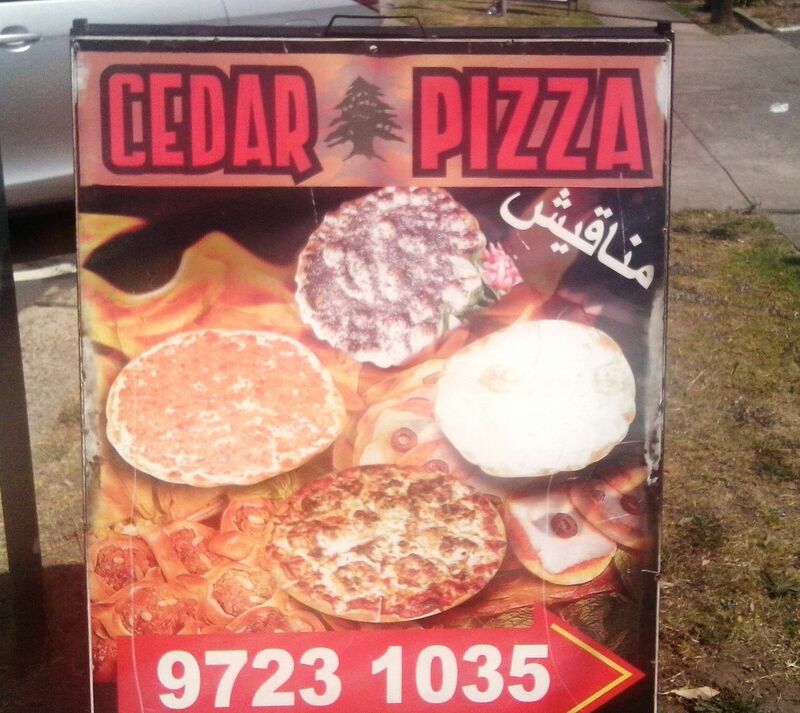 Some suburbs around Sydney have somehow remained Lebanese pizza free zones. A friend in Gymea tells me she's never seen one around there. But around Liverpool, there's a big boom going on. At the present rate of increase, by 2050 every shop in Liverpool will be a Lebanese pizzeria. With prices starting at $1.50 and mostly around the $5.00 mark, the pizza's represent outstanding value. I've updated my previous article and included the latest start-ups. If you've never tried a Lebanese pizza, or manoosh in the lingo of the Lebanese, you've never been more spoilt for choice. On busy Northumberland Street, this place distinguishes itself by its bright orange decor. It's one of the few pizzerias that offers generous in-house dining with its bright orange tables and chairs. Otherwise, the menu is stock standard Lebanese pizza. Manoosh Hut at nearby Lurnea has a steady stream of customers even though its only 11.00 am when I call in. Like most Lebanese pizzerias, there's a picture board menu with prices. Manoosh has your standard range of Leb pizza including your classic oregano for $1.50 or a sejuk (beef) and veggies. 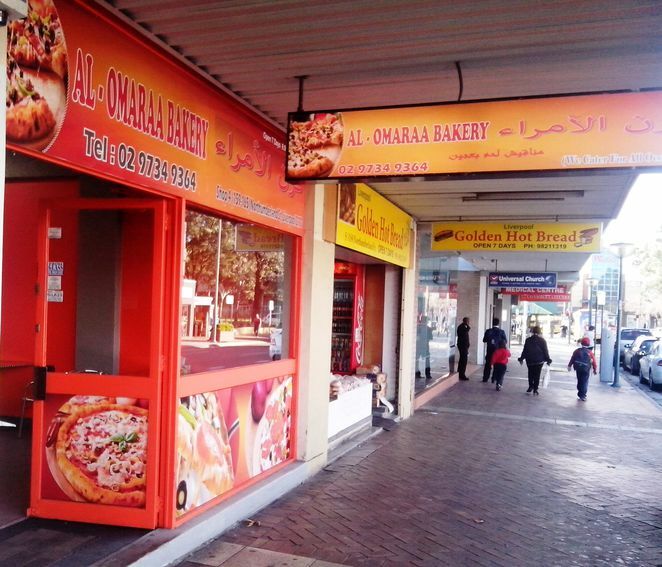 Mina Bakery trades blows with Manoosh Hut located opposite. It plys an honourable trade in Lebanese pizza with a unique mini shanglish pizza and a kebab pizza. How little Lurnea can support two pizzerias awaits to be seen. Miller Bakery goes under the radar when it comes to Lebanese pizza. There's little to indicate it's a Lebanese pizzeria until you enter. The fairly drab interior won't win any interior decoration awards, but it's Lebanese pizza what this place does and it must do well if the steady stream of customers is any indicator. The owner of this new place says he is a pioneer of Lebanese pizza, opening up one of the first stores some twenty years ago. They do a zaatar pizza for $1.50 as well as dabbling in traditional Italian style pizza from $7.00. Mounzer do the full range with cheese and spinach pies, Lebanese and Italian pizza. They do medium (from $7.00), large ($10.00) and family sizes ($12.00). It is also one of the few places that stay open during the day at Ramadan. Cedar have the largest menu I've seen yet. The generous labni, vegetable and zataar pizza is one of the most delicious I've tasted. The friendly owner is happy to make anything to order. They even do a 'Ned Kelly' pizza! The non alcoholic lemon flavoured Bavarian beer went down a treat. The latest entry into the Lebanese pizza race is Pizza Land on Meadows Road. It was fairly quiet when I called in. Pizza Land has the usual pictures of its standard Lebanese pizza range and also sells a range of traditional Italian style pizzas at reasonable prices. Mina Pizza boasts having the most extensive menu of any of the pizzerias. Tarik the owner says his toppings are all fresh, not frozen and are a healthy alternative to the standard Italian pizzas fare. Mina does the range of standard Leb pizzas like spinach and fetta as well as few specialties such as BBQ chicken and a tandoori chicken for his many Indian customers. There's tables and chairs at the front so you can eat in as well as take away. This place is easily the busiest of all the pizzerias that I have visited and it continues to be popular throughout the day. It has all the standards starting from a very cheap oregano pizza to a mainstream sounding pepperoni. Mineh also has cartons of alcohol free beer for sale to help wash down your pizza. There's a few tables out the front or you can takeaway. The original Lebanese bakery/pizzeria in Liverpool, this place has been baking and serving up their classic Lebanese pizzas for over 15 years. They haven't tried to mess with the magic formula after all this time apart from introducing a dessert hazelnut pizza. Wash down your pizza with a bottle of ayran, a traditional salty yoghurt drink. Dine in or takeaway. Cnr Moore Street and George Street, Liverpool. The Ultimate Bite's diversified menu is the exception amongst the Leb pizzerias. Not only do they make all the stock standard range of pizzas they also serve up kebabs, felafels, pies, burgers and chips. Centrally located in Liverpool, it's enormously popular with lunch goers. All day in fact! Take-away only. Wow! 12 in one single suburb! I'm gobsmacked. Definitely pizza heaven. Twelve Lebanese pizzerias in the same suburb? How many from other countries?